Africa Missions has founded and developed 4 Bible colleges to educate leaders to change the world for Jesus. We are also training children in Uganda. 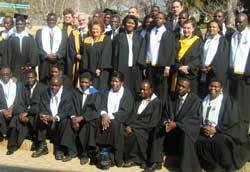 Total of 150 students in 2012 with graduations in South Africa in December and in Rwanda in November. In South Africa for refugees operating in 2 campuses. Our campus for refugees, who are mainly from French speaking Africa. Our resident campus for Zambians (English is the official language of Zambia and taught in the schools there) and other countries; provides skills developement: (Bakery, chicken farm, agriculture, brick making). Our resident Bible college in Rwanda. It draws students from Rwanda and all the neighboring countries. Most of the students at this campus are pastors with their own churches.